Japanese castle were the fortresses that are made with stone and wood. They developed from the wooden stockades of centuries before and took the face of the 16thcentury which is known as the best and known for the same. Castles in Japan were made for guarding strategic sites like rivers crossings, ports or crossroads and other landscape to keep it protected. This is a hilltop Japanese castle in Chuo-ku, kumamoto. It is having history from 1467, when it is believed to e established by ideta Hidenobu. This was a well fortified and the large castle. The castle having the recreated concentrate that was built in 1960, but the wooden buildings were there earlier was untouched as before. This is one from the three premier castles in Japan, other than Matsumoto Castle and Himeji Castle. Takeda castle is ruined castle in Asago City, Hyogo prefecture. This is also known as the castle floating in the sky. The reason, it is called floating castle, because after a look it seems that castle in floating in the sky especially during foggy autumn mornings. Originally, this was built in 1411 but, later conquered by the Toyotomi Hideyoshi during the reuniting Japan campaign. Nijo castle, a flatland castle, is one from the seventeen Historic monuments of ancient Kyoto that was designed by UNESCO as a world heritage site in Kyoto, Japan. This consists of two concentric rings of fortifications, the ruins of the Honmaru palace and Ninomaru palace, different support buildings as well as gardens. Uwajima castle is one from the twelve original castles that was left from the Edo period (1603-1867). This is small castle that was built around the start of 17thcentury and refurbished during the ownership by Date family in 1615. The castle is located on a hill and is situated by the sea in the past. It is Japanese Edo-period castle that is located in the city of Hikone, in Shiga Prefecture. It is known because it’s most significant historical building in Shiga. Hikone is from the twelve Japanese castles having kept its originality and also one from the five castles believed as the national treasure. 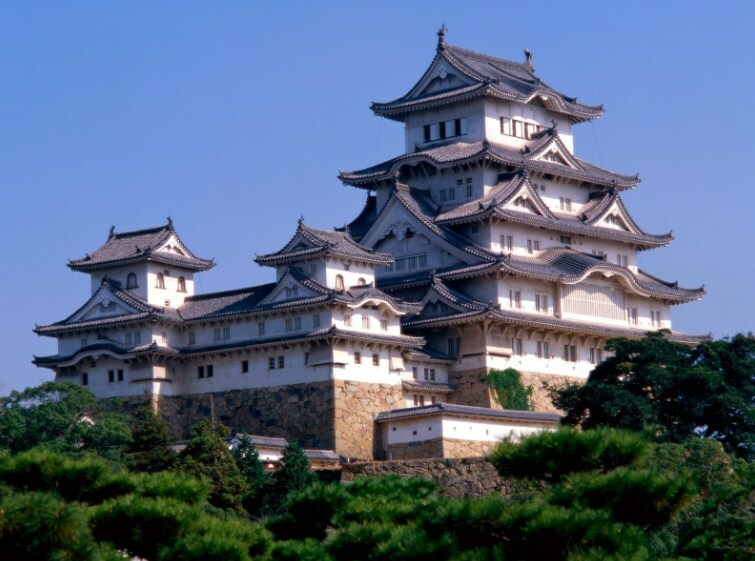 Himeji, the hilltop castle is situated in the Himeji city, in Hyogo Prefecture of Japan. Visiting the same would offer you the best experience of the architecture of prototypical Japanese castle, as comprised the network of 83 buildings having the latest defensive system from feudal period. It is a feudal castle also known as black castle located in Shimane Prefecture, Japan. It is medieval castle and only few of kind are left only with their original form that is wooden form and not reconstructed in modern concrete. During Kamakura period, Odawara was a stronghold of Doi. It was built by the collateral branch and Kobayakawa clan stood on the approximate site. It came under the control of Omori clan of Suruga, after Uesugi Zenshu Revolt in 1416. It is Japanese castle which is located in Nagoya, central Japan. Due to its importance, this was considered as the heart of the castle towns in Japan. The castle is located in the city of Inuyama, Aiechi Prefecture, Japan. It goes between the border of Aichi and Gifu prefecture and so overlooks the Kiso river. This is one from the 12 original Japanese castles. The castle was completed in 1597, but, that was destructed in 1945. Later, in 1966, the replica of same was created. The two watch towers that were saved during the bombing are available today and also known as the important cultural properties. The castle is located in Wakamatsu city, Fukushima located in Japan’s Tohoku region. The other name of same is, Wakamatsujo and the name is given because the city it was located in. The castle have gone through many reconstructions from 14th century and finally got its appearance in 17th century.